Interstate 475 forms an urban loop joining Interstate 75 with Downtown Flint from the west. The freeway carries four lanes north to Exit 4 (Bristol Road), six lanes north to Exit 13 (Saginaw Street) and four lanes along the rural stretch west back to I-75. A four-level interchange joins the below grade freeway with Interstate 69 amid ramps to Downtown. The initial route of Interstate 475 proposed in 1969 replaced what was M-54 Business. Interstate 475 returns to Interstate 75, 1.5 miles west from the six ramp parclo interchange (Exit 15) with Clio Road. Clio Road leads south from Mount Morris Township to the Flint city line at Carpenter Road. Photo taken by Don Hargraves (09/15/02). Passing under Jennings Road, motorists separate for ramps to Interstate 75 & U.S. 23 at a directional T interchange. Detroit is a 66-mile drive to the south. Photo taken 11/06/09. Two lanes default traffic onto Interstate 75 & U.S. 23 north to Saginaw. U.S. 23 remains paired with the freeway north to Exit 188 at Standish. Photo taken 11/06/09. This sign for I-75 & U.S. 23 south was replaced by 2008 with an overhead using Clearview font. Photo taken by Don Hargraves (09/15/02). According to Isaac Wilson IV, this signage was replaced in 2004. Interstate 75 between I-475 and M-57 was expanded from six to eight lanes, with an auxiliary lane between I-475 (Exit 125) and Mt. Morris Road (Exit 126) added in both directions. The ramp from I-475 north to I-75 north was also widened from one lane to two. Photo taken by Don Hargraves (09/15/02). Widening of I-75 along southbound completed in 2003 expanded the freeway to ten overall lanes between Mt. Morris Road and Interstate 475. Photo taken 11/06/09. Interstate 75 & U.S. 23 advances south one mile from the diamond interchange with Mt. Morris Road to Exit 125 with Interstate 475. I-475 loops east through Beecher and south ten miles to Downtown Flint. Photo taken 11/06/09. Four lanes of Interstate 75 & U.S. 23 south approach the Flint area through Mount Morris Township. Exit 124 departs in one quarter mile for I-475 south. Photo taken 11/06/09. Interstate 75 & U.S. 23 reduce to a six lane freeway leading south from Exit 125 with I-475. 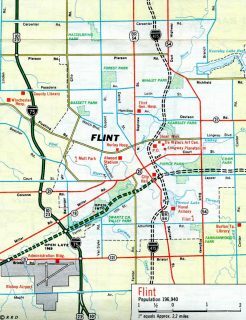 Both freeways cross paths with Interstate 69 in the city of Flint. Photo taken 11/06/09. 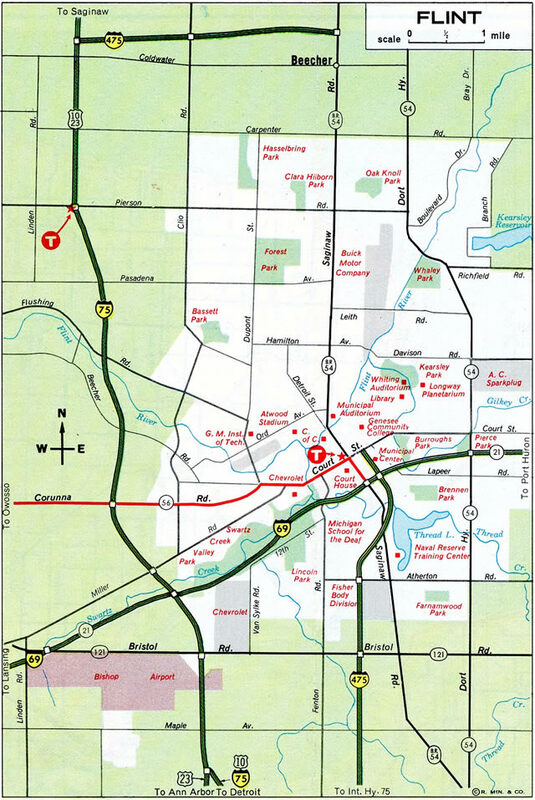 I-75 & U.S. 23 was expanded from three to four lanes from M-57 (Exit 131) south to I-475 (Exit 125) in summer 2002. Widening of northbound followed suit on the same stretch during the summer 2003. 2002 installed signs here were replaced by 2008 with Clearview font. Photo taken by Dan Garnell (12/27/02). This guide sign was posted one quarter mile north of the directional T interchange (Exit 125) with Interstate 475. It was replaced by 2008. Photo taken by Dan Garnell (12/27/02). I-75 & U.S. 23 south at I-475 south prior to the fifth lane project between Exits 126 and 125. Photo by Eric Vander Yacht (06/01). A two-lane off-ramp departed I-75 & U.S. 23 south for I-475 east to Beecher and south to Downtown Flint. Photo taken by Dan Garnell (12/27/02). This overhead was posted one mile south of Exit 125 at the Carpenter Road overpass on I-75 & U.S. 23 north. It was replaced with a ground level sign by 2011. Photo taken by Dan Garnell (12/26/02). Exit 125 leaves I-75 & U.S. 23 north at the Coldwater Road over crossing. The sign here was replaced by 2008, when ramps to I-475 were reconstructed. Photo taken by Dan Garnell (12/26/02). End shield assembly posted for Interstate 475 south as the freeway merges with I-75 south. Travelers continuing south reach the city of Pontiac in 27 miles and the Motor City in 52 miles. Photo by Eric Vander Yacht (06/01). The first sign for the wye interchange (Exit 111) with Interstate 475 appears at the overpass carrying the south end of M-54 across I-75 north. Photo taken 11/06/09. I-75 north winds west across an area of wetlands preceding the split with I-475 north. 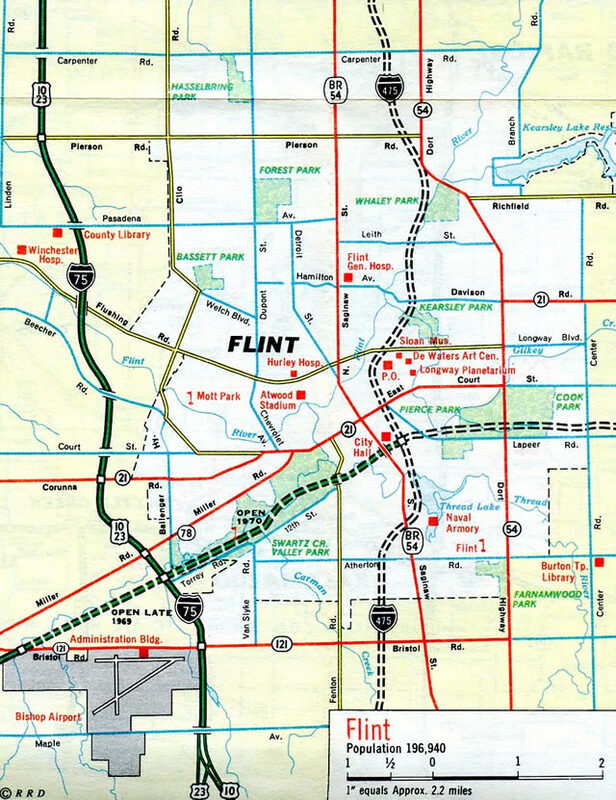 Interstate 75 skirts western fringes of the city of Flint with U.S. 23 while Interstate 475 provides a direct route north to Downtown. Photo taken 11/06/09. Interstate 475 north quickly enters the south suburbs of Flint while I-75 combines with U.S. 23 just ahead of Bishop International Airport (FNT). Photo taken 11/06/09. Two lanes separate for both Interstates 475 and 75 north at Exit 111. 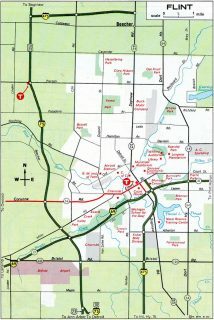 I-475 north reaches Downtown Flint in six miles while I-75 advances north to the city of Saginaw in 38 miles. Photo taken 11/06/09. This community interchanges identification sign was formerly posted 1.5 miles ahead of Interstate 475 on I-75 north. Photo taken by Dan Garnell (12/26/02). This diagrammatic overhead for Exit 111 was replaced by 2008 with separate panels for both I-75 and I-475 north. Photo by Eric Vander Yacht (06/01). This overhead was formerly posted at the Grand Blanc Road overpass on I-75 north. Photo by Eric Vander Yacht (06/01). This set of signs posted at the I-75/475 split was carbon copied by 2008 with overheads using Clearview font. Photo by Eric Vander Yacht (06/01). “Michigan Freeway System Passes 1,500 Mile Mark.” The Argus-Press (Owosso, MI), January 29, 1973. “Flint Officials Hopeful Of Getting a Construction Speed-Up on I-475.” The Argus-Press (Owasso, MI), March 19, 1974.